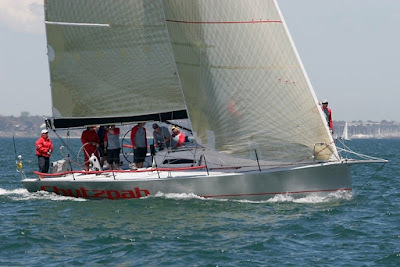 Victorian yachtsman Bruce Taylor’s hopes for a first major offshore handicap victory with his 40-footer Chutzpah from RYCV hang in the balance with the perennial Komatsu Azzurro, Shane Kearns’ two-time Noakes Sydney Gold Coast Yacht Race overall winner sliding north and meeting its required average speed target with 60 nautical miles to go, as of 0900 hours this morning, Tuesday July 31, 2018. The south-east Queensland forecast is for north-west winds 10 knots becoming north to north-easterly in the afternoon, a scenario that could jeopardise Kearns and his Sparkman & Stephens 34’s three-peat if the winds turn light. “We are off Lennox Head and the crew is quietly optimistic whereas I’ve been writing my speech since we left the heads on Saturday,” Kearns rang through at 0900hrs. Only one other boat in the Gold Coast race’s 33-year history has ever won the premier handicap category three times overall – Bruce Staples’ Witchcraft II back in 1989, 1994 and 1995. Azzurro’s wins came in 2015 and 2017. “We haven’t got there yet though the breeze is going to go north, which should be good for us when we turn the corner at Byron. We think it’s doable though we are worried about losing and winning; we might not be that popular, being the blow-homes. It never happens in the Hobart race though,” he added. A circumspect Taylor, sailing for the Royal Yacht Club of Victoria, is once again back in a position he knows all too well having scored multiple top five results from 32 Rolex Sydney Hobarts with six different Chutzpahs, but never the main trophy. He also has also competed in at least seven Gold Coast races. 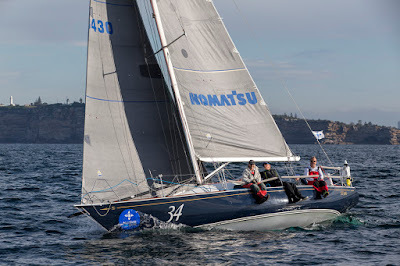 “From our point of view it’s Wild Rose and the Rolex Sydney Hobart in 2014 revisited, when we thought we won it and everyone was being nice to us and then a southerly blew Rose home,” Taylor said from Southport Yacht Club as he and his crew anxiously follow Komatsu Azzurro’s progress on the Yacht Tracker. “We were surprised how well we managed to hold onto the others going upwind and in the light and fluky stuff we held on to the other 40-footers. Once it turned to reaching conditions very early Tuesday morning that helped us get away from our main worries. It was nice to do an ocean race with boats all around you, not like the Hobart. We enjoyed seeing them all, but we’d prefer not to see Komatsu,” Taylor said. Third on IRC overall scores is Matt Allen’s Ichi Ban. 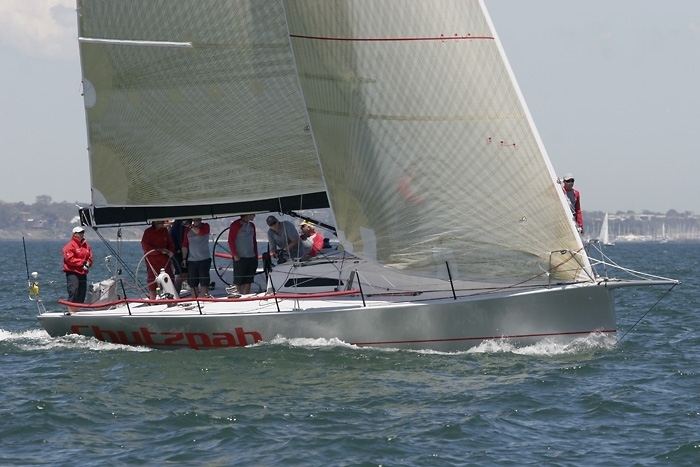 Komatsu Azzurro and Chutzpah are first and second on ORCi overall scores and leading PHS is Kevin Whelan’s Reve, a Beneteau 45F5 from the organising club, the Cruising Yacht Club of Australia in Sydney. Twenty-eight of the original 54 starters have completed the 384 nautical mile northern race and five retired for a variety of reasons, the last of those Warwick Taylor’s Airstream which is returning to Sydney via Port Stephens. Last in the fleet, the Army Sailing Club’s Jarkan 925 design called Gun Runner, still has 130 nautical miles to sail and is not due into Southport until early on Thursday August 2. The official race trophy presentation is scheduled for 10:00am Wednesday August 1 at Southport Yacht Club.